The second summit between President Donald Trump and Chairman Kim Jong-un of North Korea was held in Hanoi, Vietnam yesterday and today. It failed. The meetings on the last day were cut short. Nothing was agreed upon and signed. No common statement was issued. Trump held a press conference and gave his side of the talks (transcript). The issue seems to have been the sequencing of abolishing sanctions by the U.S. side versus the destruction of the Yongbyon nuclear reactor complex on the North Korean side. Trump: Basically they wanted the sanctions lifted in their entirety, and we couldn’t do that. They were willing to denuke a large portion of the areas that we wanted, but we couldn’t give up all of the sanctions for that, so we’ll continue to work and we’ll see. But we had to walk away from that particular suggestion. We had to walk away from that. Q: Will all the sanctions that are currently in existence remain, sir? Trump: They’re in place. I was watching as a lot of you folks over the weeks have said, oh, we’ve given up -- we haven’t given up anything. And I think frankly we’ll be good friends with chairman Kim and North Korea, and I think they have tremendous potential. I’ve been telling everybody they have tremendous potential, unbelievable potential, and we’re going to see. But it was about sanctions. They wanted sanctions lifted but they weren’t willing to do an area we wanted. They were willing to give us areas but not the ones we wanted. That the sanctions stay in place is a great disappointment for South Korea. Its president Moon Jae-in had hoped to announce new economic agreements with North Korea. The U.S. will not allow him to proceed. That Trump came to the summit with the delusion that he could get more out of North Korea before lifting sanctions is a failure of the policy process in the State Department and the National Security Council. They held the preparatory talks and knew what North Korea demanded before it was willing to go any further. Trump says that even as he "walked away" the meeting ended in a friendly way and without bad words. North Korea, Trump says, will stay committed to the freeze of nuclear and missile testing while the U.S. will stay committed to the freeze of large scale maneuvers around North Korea. Both sides are open to further talks but no dates have been set for them. If Trump hopes that North Korea will come back and offer more he will be disappointed. Neither will North Korea sit just back and do nothing while the U.S. keeps sticking to its sanction regime. The New Year speech quoted above said that North Korea will "be compelled to find a new way for defending the sovereignty of the country" if the U.S. is unwilling to budge. History shows that North Korea has always gamed out such talks. It is always prepared to let them fail and it is ready to take the next step whenever that happens. The "new way" may well allude to some new weapon that North Korea is ready to test. Cruise missiles are a possible candidate. We do not know yet the North Korean view of the talks. Their version is usually published in the official Rodong Sinmun newspaper a day or two after such talks. It will likely contain hints of how North Korea is going to proceed. Kim Jong-un came to Vietnam by train. He will travel back through China and will likely coordinate the next steps with the Chinese government. When and how he will take his "new way" will probably depend on the trade talks between China and the United States. If those too fail then all bets are again off. BREAKING: North Korean official said they asked for 5 of 11 sanctions to be lifted in exchange for partial denuclearization. Trump's comments made it seem like North Koreans had asked for ALL sanctions to be canceled. An unofficial translation of the full North Korean statement is here. North Korea again uses the phrase "corresponding measures". Ri also said that "it became crystal clear that the U.S. was not ready to accept our proposal." What was the "one more step" Trump demanded. Did it come from John Bolton? It seems likely that Kim Jong-un, not Trump, was the one who ended the negotiations. Giving the wrong impression about the sanction lifting request will came back to haunt the U.S. when (if?) the negotiations continue. Trump reportedly asked the South Korean President Moon to mediate with North Korea about step towards a new round of negotiations. After the suicide attack Modi immediately threatened to retaliate against Pakistan. He did so yesterday. In an elaborate operation Indian fighter jets released stand-off weapons, purchased from Israel, against an alleged JeM training camp near Balakot. India made explicit that it hit a "non-military" target. 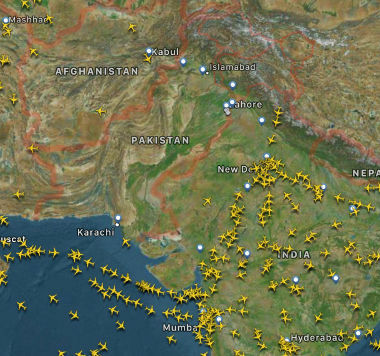 While the Indian jets did not enter Pakistan's airspace the target was within Pakistan's undisputed borders. Small scale ground combat between Indian and Pakistani at the line of control in Kashmir is nothing unusual. But the air attack exceed the limits both sides so far held to. Pakistan saw the incident as a failure of its deterrence. 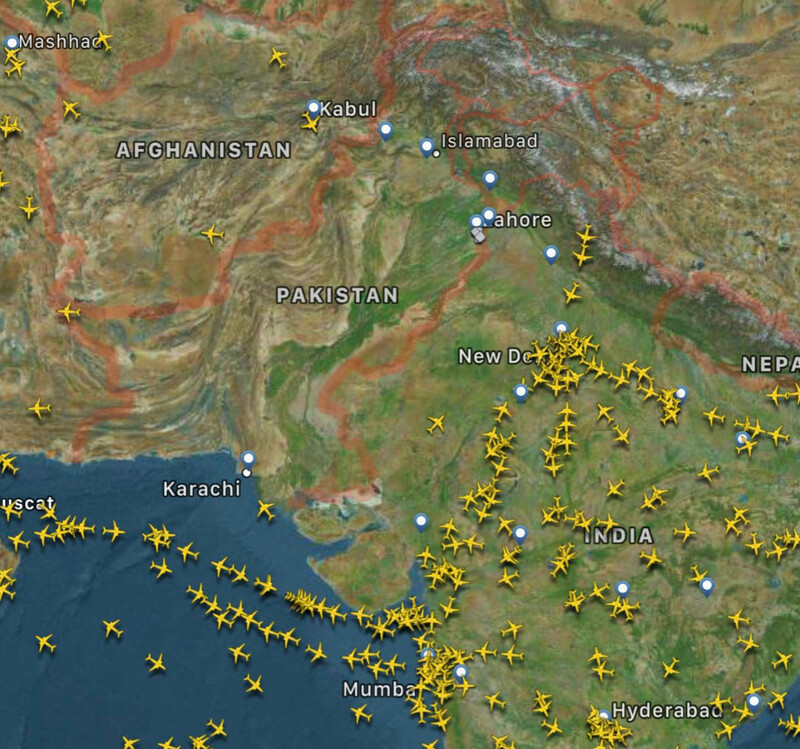 India has about 140 nuclear weapons while Pakistan has about 100. Pakistan's conventional military is inferior to India's. It therefore follows a doctrine of asymmetric escalation which allows for nuclear strikes in response to conventional military attacks. Two rather antique Indian MIG-21 jets scrambled to chase the Pakistani fighter jets away. They were lured into the Pakistan controlled air space and both were shot down. 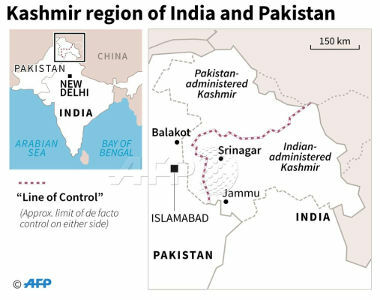 Pakistan published pictures of one of the downed jets and claimed that the other one fell into an Indian controlled area. An Indian pilot ejected from his plane and was captured by Pakistani troops who had trouble (vid) to keep the locals from lynching him. The captured pilot was blindfolded and interrogated (vid). He identified as Wing Commander Abhi Nandan, Service No: 27981, and did not respond to further questions. His father is said to be a retried Air Marshal of the Indian air force. The pilot now seems to be fine (vid). He thanked the Pakistani military for rescuing him from the mob. "The sole purpose of our action [today] was to convey that if you can come into our country, we can do the same. That was the only purpose of what we did," he said, referring to the engagement of non-military targets across the LoC. "It is important where we go from here. From here, it is imperative that we use our heads and act with wisdom," he continued. "All wars are miscalculated, and no one knows where they lead to. World War I was supposed to end in weeks, it took six years. Similarly, the US never expected the war on terrorism to last 17 years. "I ask India: with the weapons you have and the weapons we have, can we really afford such a miscalculation? If this escalates, things will no longer be in my control or in Modi's," the prime minister continued. "I once again invite you: we are ready. We understand the grief India has suffered in Pulwama and are ready for any sort of dialogue on terrorism. I reiterate that better sense should prevail. 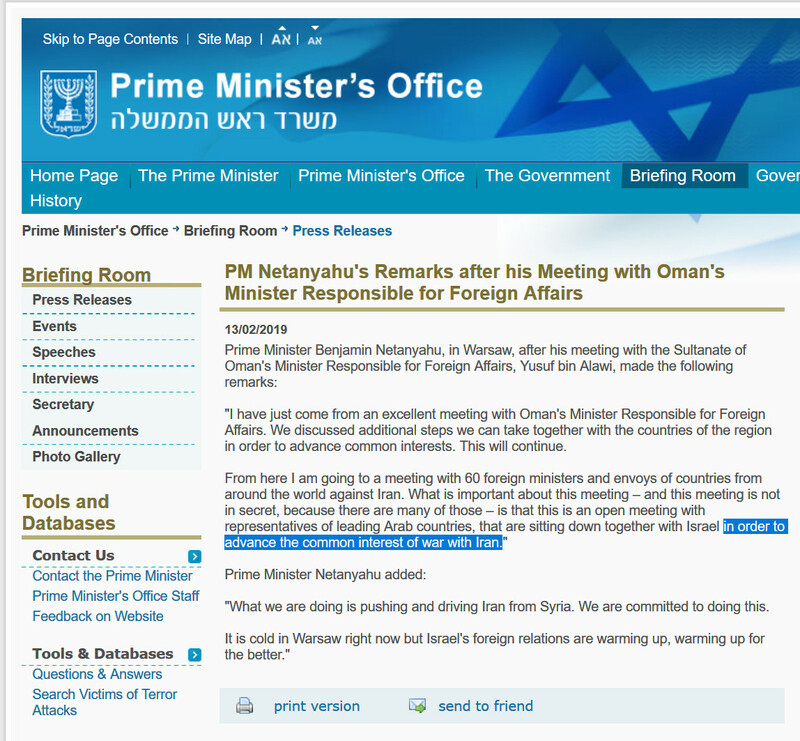 "Let's sit together and settle this with talks," the prime minister concluded. China, Russia and the United States have urged both sides to stand down and to deescalate the situation. In short: The previous government signed a contract with France' Dassault to buy 126 Rafale jets for $10.6 billion. Thirty percent of the price would flow back from Dassault to the Indian state owned aviation manufacturer HAL, which would assemble most of the planes. Modi flew to Paris and changed the deal without the knowledge of his cabinet and the country's military. India will get only 36 Rafales but pay $8.7 billion for them. Thirty percent of the money would flow back to a private Indian company belonging to the largely bankrupt, privately held Reliance Group for unrelated projects and without any know-how transfer. How much Reliance, owned by the once very rich Ambani family, would hand over to Modi and his party is yet unknown. There are calls for Modi to step down which he is unlikely to do. The issue will escalate. Not responding to today's attack will let Modi look weak and may well cost him his reelection. Responding with a new attack on Pakistan will gravely endanger both countries. Attaching the Crisis Group piece is an apt display of the utter stupidity of Richard Haass. That's because the report completely contradicts his argument. The principle of the Responsibility to Protect ..
.. is based upon the underlying premise that sovereignty entails a responsibility to protect all populations from mass atrocity crimes and human rights violations. The principle is based on a respect for the norms and principles of international law, especially the underlying principles of law relating to sovereignty, peace and security, human rights, and armed conflict. Under international law, governments must give consent to the distribution of food and medical supplies when a population’s survival is threatened, but only if the aid is of an exclusively humanitarian and impartial nature. This aid operation, however, is primarily political, in that it is intended to undermine Maduro and bring about a change of government. 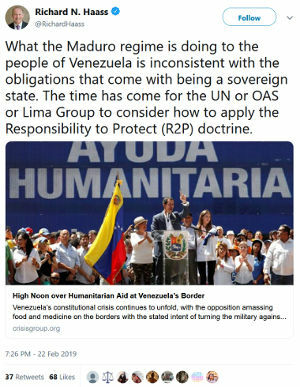 The acts of the Venezuelan government were fully consistent with "the obligations that come with being a sovereign state". To recommend a legal procedure and policy by linking to a report that contradicts that reasoning is quite daft. Furthermore Haass wants "the UN or OAS or Lima Group to consider how to apply the Responsibility to Protect". The Responsibility to Protect provides a framework for employing measures that already exist (i.e., mediation, early warning mechanisms, economic sanctions, and chapter VII powers) to prevent atrocity crimes and to protect civilians from their occurrence. The authority to employ the use of force under the framework of the Responsibility to Protect rests solely with United Nations Security Council and is considered a measure of last resort. The UNSC will of course reject any U.S. attempt to apply R2P with regards to Venezuela. The only and last time that the Security Council passed a chapter VII resolution based on R2P was with regards to Libya. The resolution allowed other states to protect the civilian population of Libya by force. The U.S. and others abused the resolution to overthrow the Libyan government and to completely destroyed the country. China and Russia certainly noted that. They will never again let such a resolution pass. That Senator Marco Rubio, a driving power behind the campaign against Venezuela, explicitly posted these pictures of Muhammad Ghaddafi before and after R2P was applied, only strengthens the case against it. 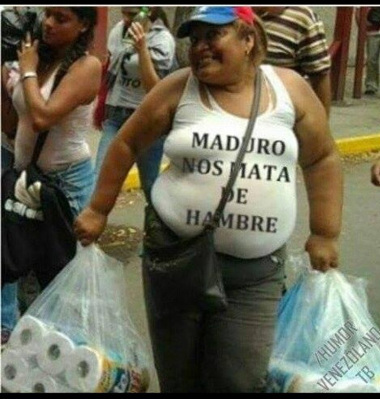 February 22 - Venezuela - Abrams To Make Sure Humanitarian Aid Flights Are "Strictly By The Book"
February 24 - Venezuela - There Was A Riot At The Border But What Else Did The "Aid" Stunt Achieve? 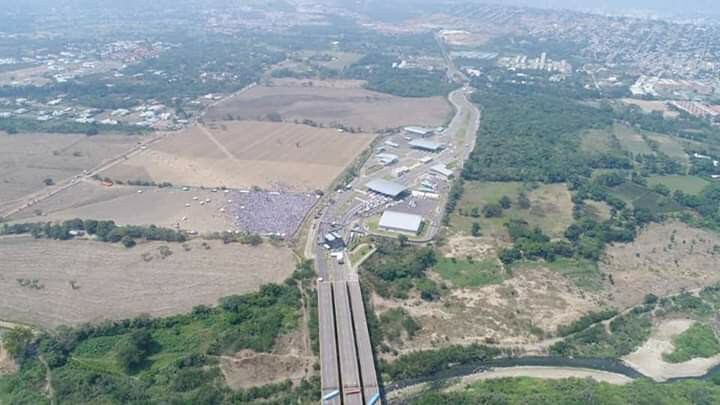 Venezuela - There Was A Riot At The Border But What Else Did The "Aid" Stunt Achieve? 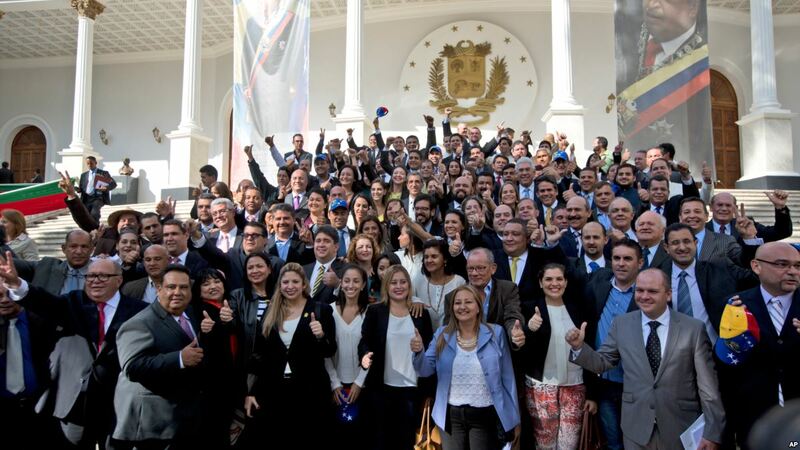 to deliver justification for further steps against Venezuela. Point 1 was clearly not achieved. 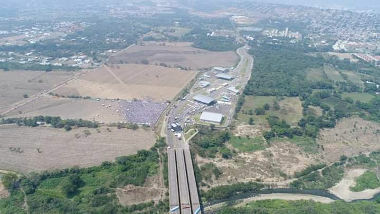 A few hundred young men attacked the Venezuelan National Guard force that closed off the border. Attempts were made to ram "aid" trucks through. Random Guyaido was nowhere to be seen. The whole thing ended in a minor riot. The violent attackers received gasoline and made Molotov cocktails to attack the guards and set the "aid" trucks alight. Here is a video that proves that. The riots continued (vid) until about midnight but neither any rioters nor the aid passed through the border. But as of Saturday night, the trucks remained stranded on the border, according to Jesús Bobadillo, a Catholic priest in Pacaraima, the Brazilian border town. All the above will not change the U.S. urge to "regime change" Venezuela. But it will certainly lower Guaido's support within the country as well as his international standing. It demonstrated aptly that he is nothing but an empty suit. Today's events force me to make a decision: to raise the international community formally that we must have open all the options to achieve the liberation of this country that struggles and will continue to fight. 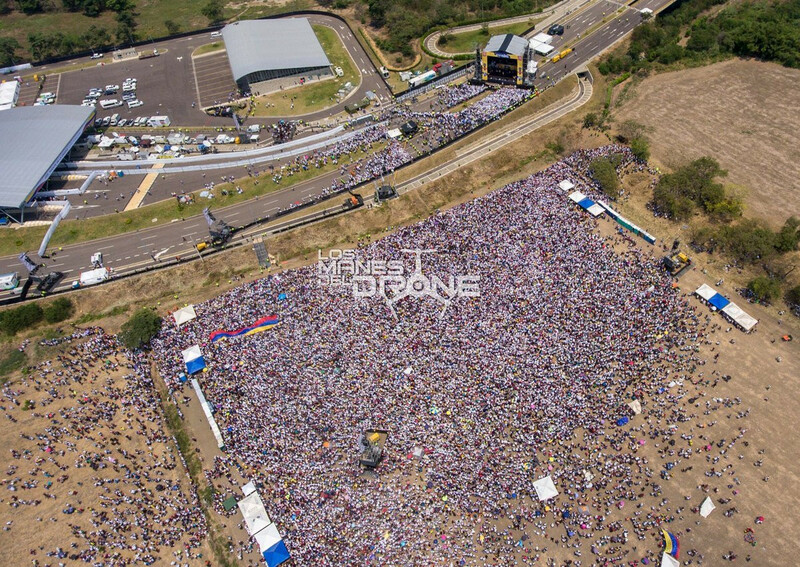 Hope was born to not die, Venezuela! To advance on our route, I will meet on Monday with our allies of the international community, and we will continue ordering upcoming actions to the internal of the country. Internal and external pressure are essential for liberation. Hope was born not to die! After discussions tonight with several regional leaders it is now clear that the grave crimes committed today by the Maduro regime have opened the door to various potential multilateral actions not on the table just 24 hours ago. U.S. Vice President Mike Pence will arrive in Colombia tomorrow to tell Guaido how to proceed. The focus will most likely be on how to start a sabotage campaign and a low level guerrilla war within Venezuela. Both will certainly hurt the country and its people but they are unlikely to achieve the larger "regime change" aim. Outsiders tend to play down the ideological commitment of some in the armed forces. [...] There are many guns in the hands of pro-regime militias. Venezuela has a tradition of guerrilla warfare. An American invasion would thus be highly risky. It would also be counter-productive, because it would deprive a new government of legitimacy and revive anti-imperialism across Latin America when the main issue is the defence of democracy. Yes, Cuba is intervening in Venezuela, and there is scant evidence that Mr Maduro will go peacefully. Even so, maintaining the broadest possible political front against him remains the best option. The next steps the U.S. will take will "soften up" its target for an upcoming invasion. They will include further measures to make Venezuela ungovernable and to starve its people into submission. One possible step, even while legally unjustifiable, is a sea and air blockade. The "soften up" phase will take many month, if not years, to achieve some noticeable changes on the ground. Only then will further action be merited. The actual point in time will depend on how it may influence Trump's domestic standing. 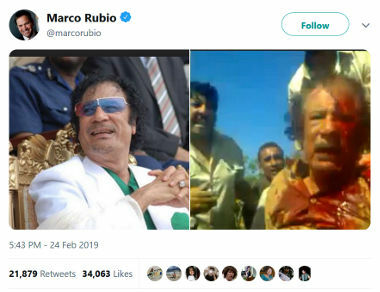 Would launching a war on Venezuela help him to get reelected or will the war have to wait until he won his second term? source - bigger 200,000 people?? Venezuela - Abrams To Make Sure Humanitarian Aid Flights Are "Strictly By The Book"
Special Representative Abrams will lead a U.S. government delegation to accompany humanitarian supplies to be transported from Florida to Colombia by military aircraft. While in Colombia Special Representative Abrams will meet Colombian President Duque and visiting delegations from Central and South America. For several centuries China had a monopoly on silk. It was exported along the silk road to Persia and from there to Europe. Silk production was highly profitable. The export of silkworms and their production method was prohibited. in the mid 6-th century two monks made their way from Europe to China and found out how silk was produced. They reported back to the Byzantine emperor Justitian I who induced them to secretly acquire silkworms and to smuggle them back home. The monks managed to do that and soon thereafter the Chinese silk monopoly, and Persia's monopoly of silk trade with Europe, were no more. The U.S. fears that China will soon be able to compete with it in computer chip design and fabrication. It is trying to block China from building its own chip factories and Congress even wants to block chip exports to specific Chinese companies. It is race that the U.S. will lose. Technology and the means of producing it inevitably proliferate. The 5G mobile data networks will use new frequencies and algorithms to deliver gigabit data streams from, to and between mobile devices. This will allow for completely new applications like direct communication between (semi-)autonomous cars at any road crossing. Worldwide a number of companies are working to provide 5G technology. That involves antennas, base stations, new hard- and software in the periphery and in the core telecommunication systems. Main providers of such systems are U.S. companies like Motorola, Qualcomm and Cisco. Others are Ericsson and Samsung. One of the largest one is the Chinese company Huawei. Currently Huawei is the most advanced company in the 5G field. It started early and invested huge sums into research and development for 5G technology. It owns some 15% of all relevant patents. It is currently the only provider that can deliver an end-to-end solution for 5G networks. As it serves the huge market of China it can produce on a large scale and sell its equipment for less than other companies do. The other dominant telecommunication equipment provider, including those in the United States, are lagging in 5G technology. They did not invest early enough and are now late to deliver. Instead of investing in faster development and better technology the U.S. is trying to block Huawei from selling its goods. This hurts the development of other countries that want to provide 5G networks to their people. The U.S. has long pressed its allies not to use Chinese equipment in their phone networks. It falsely claims that Huawei equipment is a security threat. Britain is able to manage the security risks of using Huawei telecoms equipment and has not seen any evidence of malicious activity by the company, a senior official said on Wednesday, pushing back against U.S. allegations of Chinese state spying. “Our regime is arguably the toughest and most rigorous oversight regime in the world for Huawei,” [Chiaran Martin head of Britain’s National Cyber Security Centre (NCSC), which] is part of Britain’s GCHQ intelligence agency, said at a cybersecurity conference in Brussels. If Britain, a member of the Five Eyes intelligence sharing group, sees no danger in using Huawei then the U.S. has lost the case. Pompeo's thread sounds harsh. It is certainly not in the spirit of "winning through competition" that his boss promotes. It is also useless. U.S. secret services exchange information with many other countries. The Five Eyes cooperation with Canada, Great Britain, Australia and New Zealand involves a gigantic world wide data acquisition effort known to "collect it all". The results are shared within the group. U.S. services also exchange data with many other spy services on a more limited base. This includes exchanges even with 'enemy states' like Russia or Syria. But these are all two or more sided deals. They are based on give and take. If the U.S. stops providing, for example, information about Islamic State terrorists, others will stop to provide similar information to the United States. Exchange of intelligence is always done to the advantage of both sides. If the U.S. would stop to provide what it does it would also lose access to the information the counterparts provide. Besides that the use of this or that mobile phone system or technology is irrelevant for exchanging data about security threads. Pompeo's threat is meaningless and will be rejected. Huwaei is no more a security threat than any other telecommunication equipment provider. The greatest danger from all of them are quality issues with their code that allows various secret services and other criminals to hack into such equipment. The Snowden files provided that the U.S. regularly hacks into and bugs U.S. provided communication equipment. In 2012 the NSA tried to install an exploit on the Cisco routers that run the central Internet node of Syria. It made an error that 'bricked' the routers and cut Syria off the Internet. Unlike many U.S. companies Huawei gives foreign governments access to the source code for its equipment. It supports special laboratories in Germany, Britain, Singapore and elsewhere, that can inspect and test the code and equipment before its use. It recently announced that it would also open its central 5G development process in China to foreign government inspection. The only issue that these labs have found so far is that the Chinese programmers at Huawei are as sloppy and error prone as programmers elsewhere are. Their coding is neither more elegant nor of higher quality. The NSA will have little problems hacking into it. The U.S. attempt to block the deployment of Huawei equipment is obviously made for economic reason. The building of the Internet provided a huge boom to the U.S. telecommunications industry. A move into the 5G markets is supposed to prolong that. Unfortunately U.S. companies dropped the ball. Their leadership wanted to show short term profits and wasted it on share buy backs. The companies invested too little in research and development. Huawei beat them fair and square by being the first to offer the full line of the next generation products. With hindering Huawei the Trump administration is playing for time so that U.S. companies can catch up. But that is again stupid short term thinking. The real profits in 5G networks will not be made with communication equipment but with the products enabled by it. The U.S. developed the Internet and sold it to the world. Cisco and other hardware manufacturers got rich. But there are also Google and Amazon which became even richer by providing the applications that run on top of the net. If "the west" delays 5G deployment while China implements it, Chinese companies will have the time advantage to create the products which will run on top of the new global communication layer. It would allow China to incubate the next Google and Amazon like giants before other countries can even test the basic technology. That is the very reason why European countries do not follow the U.S. lead. It was short term thinking that let the U.S. drop the ball on next generation telecommunications. If it wants to regain the lead it will have to change that attitude. Page 136 of McCabe's new book, recounting a 2017 Oval Office meeting: "Then the president talked about Venezuela. That’s the country we should be going to war with, he said. They have all that oil and they’re right on our back door." It is not only Trump's idea to 'regime change' Venezuela. Ever since 1998, when Hugo Chavez was elected, the U.S. plotted to 'regime change' Venezuela. It was Obama who put sanctions on the country. 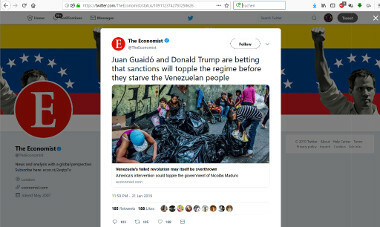 Right wing economists have for years thought up detailed plans on how to rob Venezuela of its national assets. Plan A for the recent coup attempt failed when the Venezuelan military did not accept Random Guyido's brazen claim to the presidency. There was no plan B. The U.S. is now improvising. 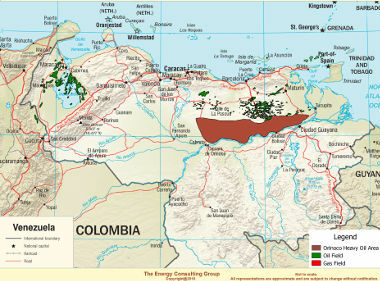 The delivery of "humanitarian aid" is a pretext to break the border between Colombia and Venezuela. RED Team officers, the report explains, would carry out development activities, but they would also have training and expertise that are not typically included in USAID job requirements. “RED Team personnel would be able to live and work in austere environments for extended periods of time and actively contribute to their own security and welfare. They would be deployed farther forward than USAID personnel traditionally deploy and would routinely operate under the authority of the host agency with whom they deploy, acting in accordance with their security posture,” the report reads. “RED team members would be trained and authorized to conduct themselves as a force-multiplier able to contribute a full suite of security skills as needed,” it says. USAID officers will also be special forces? Special forces will also be USAID workers? Which is it? How many of these 'Red Teams' are now in Colombia waiting to cross into Venezuela? 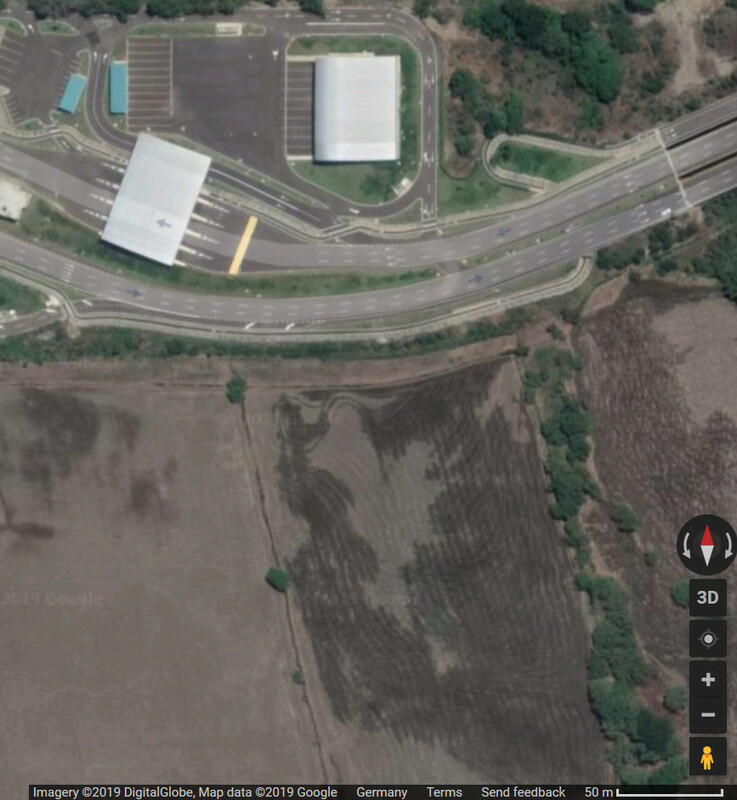 On Saturday February 23 a breach of the Venezuelan border will be attempted with the intent to provoke an escalation. That escalation will then be used to justify further action up to military strikes or even an invasion. The Brazil route is for now too remote for the desired media attention. A provocation, involving victims, is being put together under the guise of a humanitarian convoy," Zakharova stressed. "They need it just as a pretext to use outside force, and everyone should understand that." Venezuela is not in need of U.S. aid. It is need of an end to the economic sanctions that put it under a medieval siege. There is no current lack of food or medicine like in Yemen though some products may run short. The UN, the Red Cross and Caritas already have aid distribution projects within Venezuela. They reject the U.S. aid delivery as a political stunt. The International Committee of the Red Cross recently doubled its budget for Venezuela to $18 million and is ready to provide more. Last week 933 tonnes of medicines from Cuba and China arrived. Another 300 tons from Russia is supposed to arrive today. The Venezuelan government has had enough time to game out how best to respond to the breach attempt of the border. It needs to block the roads AND it needs to prevent provocations. Trump likes walls on the border. Venezuela should give them to him. 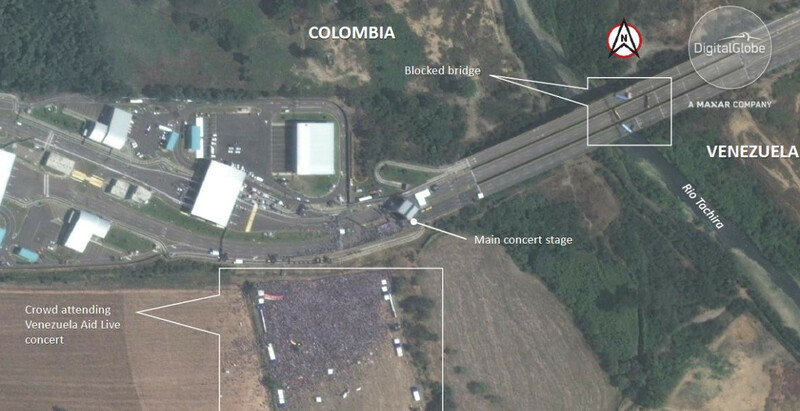 My advise to Venezuela is to use high concrete barricades with barbed wire and mines in front of them across all vehicle border crossings points. The purpose of the mines is to prevent attempts to remove the wire and the barricades. Large posters should warn of the deadly danger of the mines. If someone gets hurt by them, it will clearly be their own fault. Passage on foot must be allowed as usual. Armed soldiers should be kept out of sight. Trump said a lot about the national security need for "beautiful walls." A large banner with a relevant Trump quote should top each of the barricaded crossings. At the recent conferences in Warsaw and Munich the Trump administration failed to gain any European support for its anti-Iran strategy. Iraq has likewise rejected all U.S. attempts to position it against Iran. If the U.S. wants to attack Iran it will need to go it alone. Its 'allies' west of the Persian Gulf will give financial support but are not a serious military force. What they can do though is to ramp up terrorism against Iran. [T]oday, Saudi Arabia and the UAE are Israel’s covert allies in West Asia. They are joined at the hips in the project to overthrow the Iranian regime. 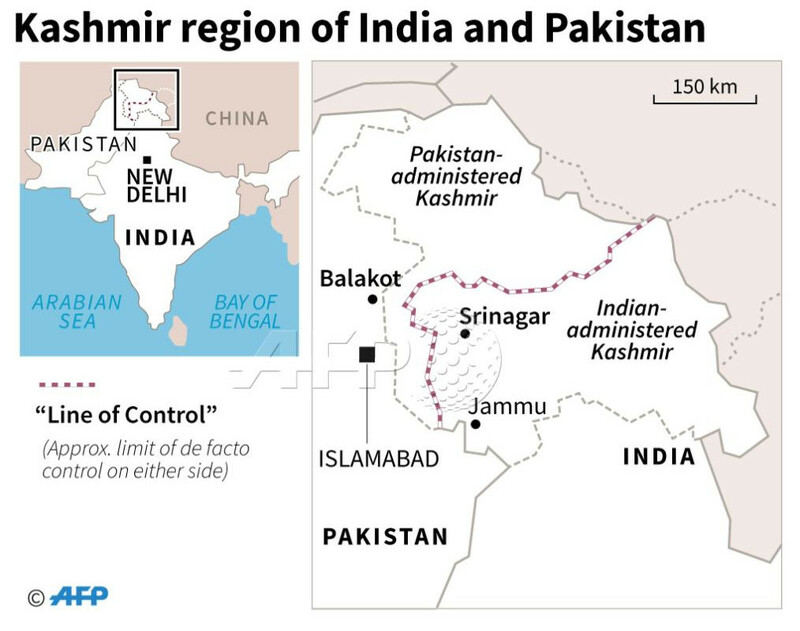 We may expect that the Af-Pak could become a major theatre from where their covert operations would be launched with the help of Pakistan under the watch and protection of the US to destabilise Iran. Tehran has repeatedly alleged that the two Arab states are working in tandem with the US and Israel. Bhadrakumar points to several recent incidents that suggest that such a plan is indeed in the making. He urges the Indian government to renew its alliance with Iran to counter such acts. The Taliban will not like any plan that leaves foreign forces in their country. Removing all foreign forces from Afghanistan has always been their foremost aim. Yesterday the Taliban negotiators were supposed to meet their U.S. counterparts in Islamabad where they would also have talks with Pakistan's Prime Minister Imran Khan and probably with Khan's current guest, Clown Prince Muhammad bin Salman of Saudi Arabia. They canceled the talks on short notice. They may want to avoid additional pressure to submit to the U.S. plans of keeping some troops on Afghan ground. Iran is also in talks with the Taliban. It may be able to offer them an alternative to the support they get from Pakistan. The U.S. has left the Afghan government in Kabul out of its talks with the Taliban while Iran kept it fully informed. Kabul may also prefer Iranian help in mediating an end of the long conflict. Securing its eastern flank will be a high priority for Iran. A bid to change the allegiance of the Taliban from Pakistan to Iran may be the best way to achieve that. A large double-tap car bombing (vid) hit Idleb city in northwest Syria today. Some 20 to 30 people were killed and more wounded. 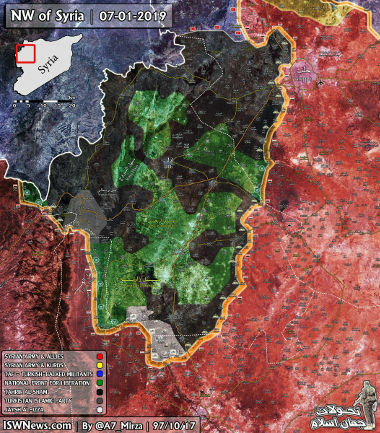 Idleb governorate is controlled by the al-Qaeda aligned Hayat Tahrir al-Sham (HTS) but many other terrorist groups continue to exist within the area. All fight each other over the available resources. In September the Astana agreement between Turkey, Russia and Iran was the basis of a ceasefire in Idleb governorate. Turkey was supposed to cleanse the area of HTS and other terrorist groups. It deployed soldiers to fortified observation posts around the region but did little else to fulfill the agreement. It is likely that many of these new arrivals are ISIS terrorist who fled from east Syria to Turkey and were then routed towards Idleb. The terrorist in Idleb governorate continue to attack Syrian troops around them. 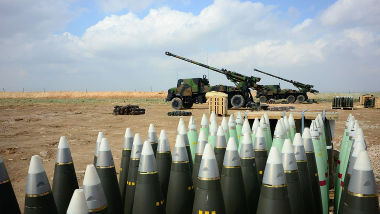 They use up quite a lot of ammunition and must have supply lines from Turkey to sustain the fighting. Another recent meeting in the Astana format with Russia, Iran and Turkey confirmed the basic agreement but did not achieve a common position on how to proceed. A: We should leave that to our military experts. We do need an operation, but we have to decide on whether it will be Turkey’s operation or some other countries’. We should not hope to make a deal with the children of Ahrar al-Sham. That is a false hope, they are terrorists, they are al-Nusra, they are the children of al-Qaeda. At the recent security conference in Munich Russia's Foreign Minister Sergej Lavrov also mentioned (vid @~15:00min) the situation in Idleb. He said that there would be common Russian and Turkish patrols in some areas of Idleb governorate but provided no details. which together can be used to "shake 'n bake" the enemy forces. The tactic is highly controversial. Several times during the last months bad weather prevented the use of aerial bombing and artillery fire against ISIS. The terrorists always used these pauses to counterattack. The poorly armed and led Kurdish/Arab SDF suffered a lot of casualties because of these. The colonel opines that a well armed professional ground force would have shortened the conflict with less casualties and much less damage. The original essay by the soon to be former colonel was taken down from the web. It is available in French on page 65 of this pdf. It is still not clear if or when the U.S. forces will leave northeast Syria. President Trump had asked Turkey to take over the area but Syria, Russia, Iran and the Kurdish forces the U.S. used as proxies against ISIS are against this. A U.S. attempt to recruit British, German or French forces to occupy the area failed. 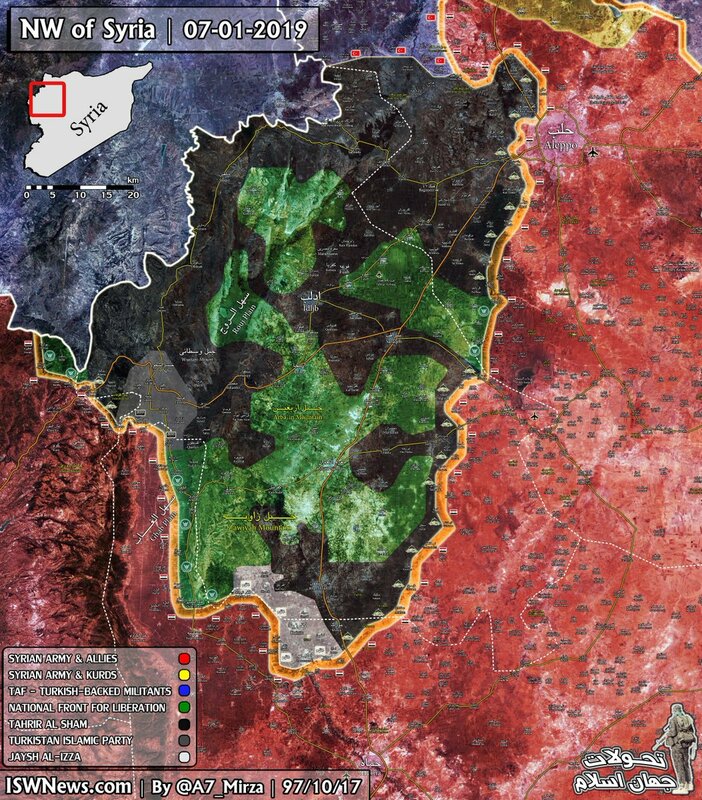 The Syrian ground must obviously be turned back to the Syrian government. The Kurdish forces, controlled by the anarcho-marxist PKK/YPG which Turkey and others designate as terrorists, use their current position to demand political autonomy in the area they now control. The Syrian government is strongly against this. Any federalization of Syria would be the beginning of its end. That the implementation of elected local administrations is offered now is a clear sign to the Kurds that they can get some autonomy but not the wide ranging one that they ask for. While they can have local elections, councils and administrations as all other areas will have, there will be no separate armed force, police of judicative in Kurdish majority areas. The offer is quite clear and the consequences of not accepting it would be harsh. The Kurds and the area they hold must come back under Syrian government control or Turkey will grab it and will put the Kurds under its boots. The pigheadedness of their leadership could easily lead to that. In his speech Assad already predicts that they will reject his offer before - maybe - accepting it. A few hours after Assad's speech the Kurdish commander of the SDF was again begging the U.S. to keep 1,500 of its troops there. Mazloum Kobani, commander-in-chief of the US-backed Syrian Democratic Forces (SDF), called on international coalition allies to keep 1,000-1,500 troops in Syria. “We would like to have air cover, air support and a force on the ground to coordinate with us,” Kobani told reporters at an undisclosed airbase in northeast Syria, Reuters reports. It is very unlikely that Trump will change his position. The U.S. troops will leave. Only the Syrian government can give the Kurds the protection they need. How many more Kurds will have to die until their leadership finally accepts that? The U.S. attack against Venezuela triggered riots in Haiti. 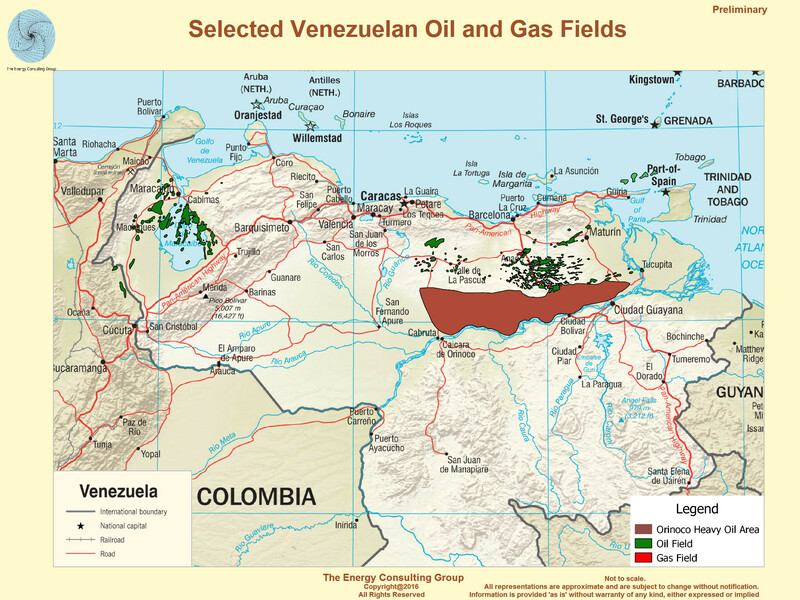 Haiti received oil and credit from Venezuela under very preferential conditions. The money saved was supposed to go into a special PetroCaribe fund to be spend on social projects in Haiti. When the U.S. enacted sanctions against Venezuela, Haiti stopped paying and the cheap oil flow ended. The fund was looted by local politicians. 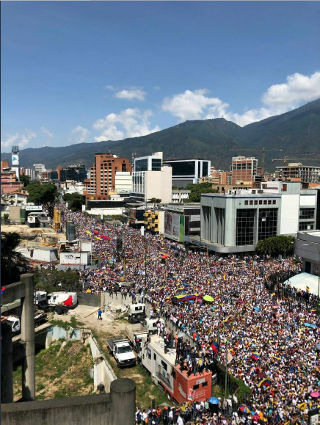 When the government then supported the U.S. coup attempt against Venezuela the people had enough and took to the streets. The Haitian people have been protesting for five days against the dictator who supports Guaidó in Venezuela, Jovenel Moises. In 5 days, the repressive forces of this criminal have murdered 52 Haitians and left 247 wounded. So you can see the streets of Puerto Principe, full of bodies. The video attached to the above tweet shows five civilians, presumably dead, laying in the road. A former chief of staff Nicolas Maduro, now a professor at Science Po in Paris, warns in an interview that the situation in Venezuela could easily escalate into a civil war. Q: One of the things that have been said by the opposition very clearly is that there will be new elections. That is part of their plan. A: And what guarantees that the departure of Maduro doesn't create a civil war, for instance? The reality of Venezuela is that it is a very polarized country. It is totally unrealistic or irresponsible to think or to assume that there are all the guarantees for Venezuela to be in a peaceful situation. In order to be an election, you have to agree on the terms of that election. When will the election be held? Who can be allowed to run for those elections? And that's exactly the problem — saying there will be elections is assuming that the problem is solved before even addressing it. Greg Grandin on sovereignty and Latin America: What’s at Stake in Venezuela? 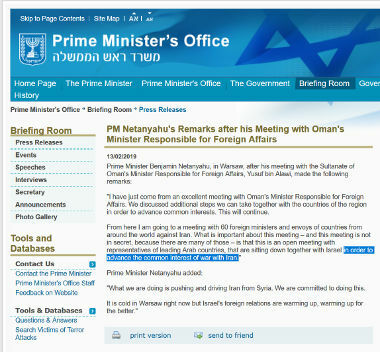 February 13 - Netanyahoo Asks Arabs To "Advance The Common Interest Of War With Iran"
In a newly published essay, a close aide to the Russian President Vladimir Putin describes the system of governance in Russia. It stands in contrast to the usual 'western' view of the 'autocratic' Russian state. Putin is reassessing history to make the case for adventures abroad. Now, however, the Russian government is considering reversing this earlier verdict, with the Duma set to approve a resolution officially reevaluating the intervention as one that took place within the bounds of international law and in the interests of the U.S.S.R. 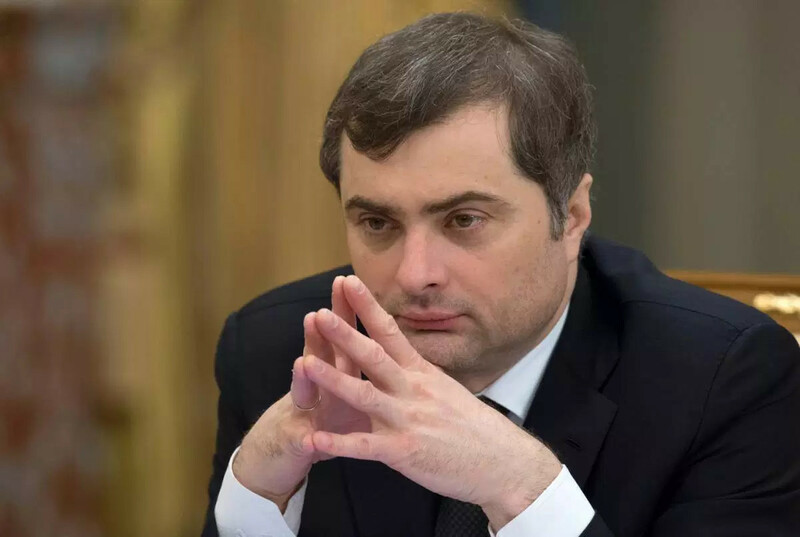 The Kremlin is rewriting history to retrospectively justify intervention in countries such as Ukraine and Syria as it seeks to regain its status as a global power. To avoid domestic opposition, [Moscow] cannot allow the public to perceive Syria through the prism of the Afghan experience. Putin and his allies have decided to tackle this problem head-on by reinterpreting that experience. That is why perhaps Putin, and Russian lawmakers, are marking the poignant anniversary of the Soviet withdrawal from Afghanistan by attempting to ascribe meaning to that long-lost meaningless war. The columns is typical for the negative depiction of Russia, and its elected leader. Each and every move in the bowels of the Russian Federation is, without evidence, ascribed to its president and his always nefarious motives. Most anticipated the Duma’s Afghan bill would re-appear for final consideration earlier this week, signed by Mr Putin in time for today’s anniversary. Unexpectedly, however, the bill disappeared from view at the last minute, with insiders citing a lack of agreement of a final draft. The resolution, which the Washington Post authors claim is motivated by Putin's need to justify current interventions, was not pushed by Putin at all. It was the Kremlin that stopped it. How does that fit to the presumed motives they muse about? The 'western' view of the Soviet war in Afghanistan, the "long-lost meaningless war", is that it was the catastrophic for the Soviet Union and led to its demise (pdf). That view is wrong. The war was neither meaningless, nor lost. The war was seen as strategically necessary to keep fundamentalist Islamists, financed by the United States, from penetrating the southern republics of the Soviet Union. When the Soviet army pulled out of Afghanistan it left a well equipped and capable Afghan army behind. The Afghan government was able to resist its U.S. financed enemies for three more years. It fell apart only after financial support from Russia ended. In size and relative cost the Afghan war, and its domestic impact in the Soviet Union, was only a third of the size and impact of the U.S. war in Vietnam. The Vietnam war did not destroy the United States and the Soviet war in Afghanistan did not destroy the Soviet Union. The reasons for its demise were ideological inflexibility and a leadership crisis. Those problems have now been solved. The intentionally provocative essay is central to understand what motivates the new Russia and how and why it functions so well (when compared to earlier times). Russia stopped collapsing, started to recover and returned to its natural and its only possible condition: that of a great and growing community of nations that gathers lands. It is not a humble role that world history has assigned to our country, and it does not allow us to exit the world stage or to remain silent among the community of nations; it does not promise us rest and it predetermines the difficult character of our governance. He points out how Russia early on (see Putin's 2007 speech in Munich) warned of the dangers of the U.S. led globalization and liberalization that tries to do away with the nation state. Putin will have signed off the essay before it was published. It is, like his Munich speech, a public challenge to the western ruling class. "Wake up," it says. "Don't rely on those dimwits who ascribe this or that superficial motive to us. This all goes much deeper." The western Russia analysts will write heaps of bad articles about the Surkov essay. They will probably claim that it shows that Putin has delusions of grandeur. I for one read it as a honest description of Russia's natural state. We thankfully do not have to rely on the 'experts'. Those who want to understand Russia can read the essay themselves. The U.S. coup planners and their Venezuelan puppets had hoped that the Venezuelan military would jump to their side. That was wishful thinking and unlikely to happen. They also thought up some "humanitarian aid" scheme in which pictures of trucks crossing a long blocked bridge would soon shame the Venezuelan president into stepping down. That was likewise nonsense. Unless the U.S. is willing and able to escalate, the coup attempt is destined to fail. 'Western' media now recognize that phase 2 of the coup plan is in deep trouble. Today the Guardian, Bloomberg and the New York Times all describe growing frustration with the lack of success. [T]hree weeks after Guaidó electrified the previously rudderless opposition movement by declaring himself interim leader, there are signs his campaign risks losing steam. 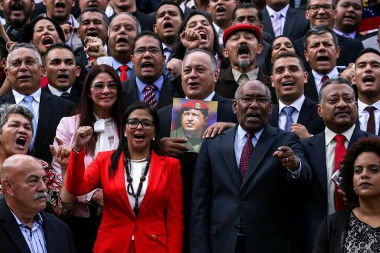 Since Juan Guaido declared himself interim president three weeks ago and offered amnesty to officers who abandon Maduro, more than 30 countries led by the U.S. have hailed the move, waiting for the military to follow. There hasn’t been a rush to his side. In a country with more than 2,000 generals and admirals, only one top officer -- who commands no troops -- has pledged allegiance to Guaido. This is a major reason why the revolution isn’t moving as quickly as some had hoped when Guaido electrified the world on Jan. 23 with his declaration. This has led to impatience and finger-pointing. U.S. policy makers and those around Guaido -- as well as leaders in Brazil and Colombia -- are eyeing one another and worrying about failure. Officials in each camp have said privately they assumed the others had a more developed strategy. [The opposition's] goal was to bring the supplies into Venezuela, forcing a confrontation with Mr. Maduro, who has refused the help. 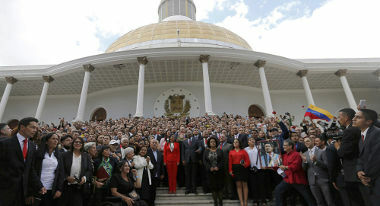 This would cast Mr. Maduro in a bad light, opposition leaders said, and display their ability to set up a government-like relief system in a nation where the crumbling economy has left many starving, sick and without access to medicine. 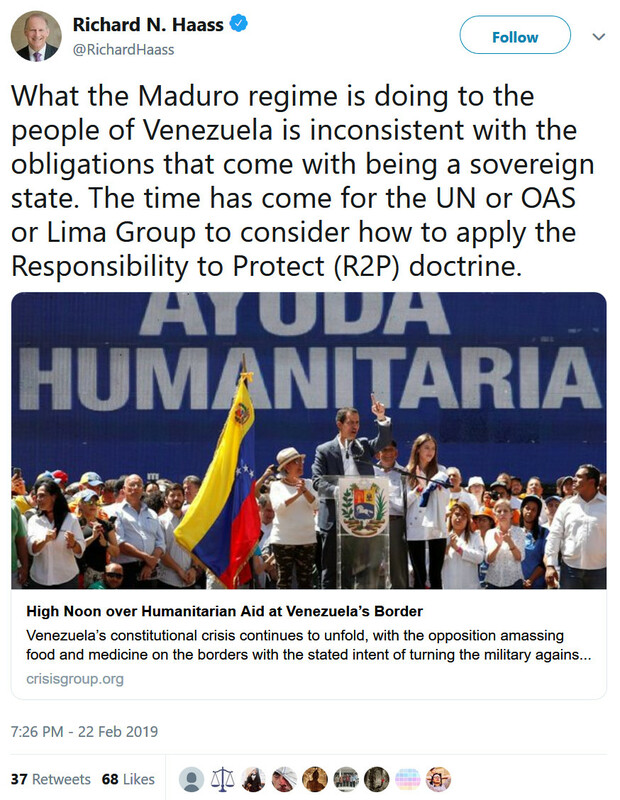 And what does he think the battalion of Venezuelan soldiers between the two groups will do? Just step aside and allow an invasion of their country? 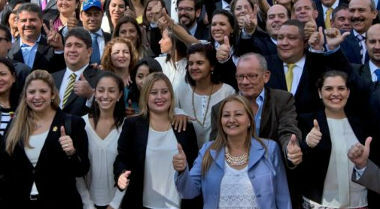 “The opposition has created immense expectations, and it’s not at all clear they have a plan for actually fulfilling them,” said David Smilde, a Venezuela analyst at the Washington Office on Latin America. “One month after the swearing in we have done it. This February 23 the humanitarian aid will enter the country. 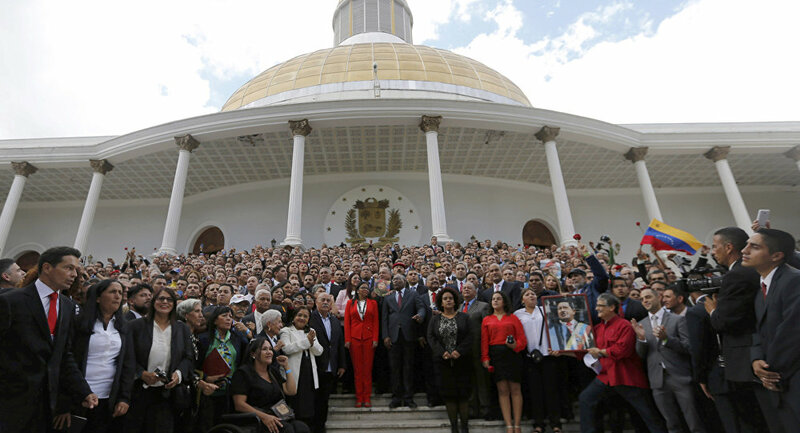 The Armed Forces have 11 days to decide if they are on the side of the Venezuelans and the Constitution or on that of the usurper,” he claimed in reference to President Maduro. If the U.S. does not do more than it has done so far the government under President Maduro can sit this out. The sanctions and the lack of oil revenue will create many immediate problems. But in a few weeks Venezuelan oil will have found new buyers. Fresh money will come in and new sources for imports of medicine and staple food will have been found. Over the same time the Random Guy will lose support. The party he nominally leads only won 20% of the votes. The other opposition parties were never informed of his plan to declare himself president. Their support for the step was lukewarm and will cool further. They may in the end support the mediation talks Maduro has offered and which the UN, Uruguay and Mexico also support. The talks could lead to new parliament and/or presidential elections in a year or two and thereby solve the situation. The U.S. would not be satisfied by a compromise solution. Trump is now committed to 'regime change' in Venezuela. But how can he do it? Waging an open war against that country would be very messy, expensive and difficult to justify. To start and support a guerilla war - Elliott Abrams specialty - takes time also costs a lot of money. The chances to win it are low. Moreover Trump wants to get re-elected but could lose many votes over both scenarios. What else then can he do?